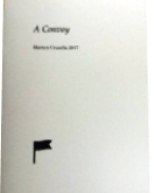 Stuart Henson considers the elegance of two pamphlets by Martyn Crucefix. If a Leaf Falls Press, 2017. It’s forty-five years since Eric Schumacher made ‘Small is Beautiful’ part of the collective consciousness yet there has never been a better time than now for the pamphlet or the chapbook. 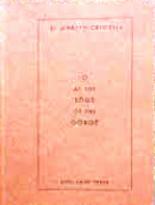 Politicians may have learned to manage the soundbite and subsequently the tweet for their own ends but the litel book with its quirky personality and its limited-edition reach retains an independence of its own. The Blakean spirit is alive and well, and never more so than in these two somewhat leftfield offerings from Martyn Crucefix. When it comes to publishing small runs Sam Riviere’s ‘If a Leaf Falls’ initiative has got it down to a fine art. A Convoy appeared last year in an edition of 38 which is about par for the press—and it means you’re going to have to work hard to find one if you’re not a subscriber. Three dozen will disappear like hot cakes. Like the artisan bakery or the micro-brewery the micro-publisher can keep his/her costs down and the quality up, but the audience will be, perforce, small too. There’s an ‘exclusive’ appeal in this: the lucky owner is part of an underground, a samizdat exchange that subverts the economies of the conglomerates—and an intellectual attraction: ‘I will not jump with common spirits’. To be fair to the press, though, it’s not seeking to please the barbarous multitude. Riviere’s intent is to publish ‘procedural writing, conceptual writing and appropriation’. Each booklet is plain, staple-bound, with a small logo-design in black on the cover that’s linked to the content—in this case a pennon that might grace a military convoy. It works magically. The functions of memory and dream are foregrounded. Fragmentation is both medium and message. You end up feeling that this is exactly how it must have been. The story is all the more haunting because the loose ends will never quite tie up. It’s a subtle effect which keeps the texture light, and in this instance also refers us to the compositional process, the use of notebook and sketch, since the third-person O is never entirely distinct from the poet. Orpheus, of course, is the genius of Rilke’s Sonnets to Orpheus which Crucefix has previously translated, along with the Duino Elegies, and a floating Rilkean quality haunts this sequence too. The splicing of each poem to the next is echoed by the illustration which often folds over like a map from recto to verso. Indeed the imagery of the map with its squares, contours, path lines is part of the inspiration. A cloud of bees could be the dots on a distribution map, metamorphosing to scree, to a sand-bar, to the outline of a leaf. A lavender stem becomes the contour of a gorge, the pattern of a stream, which in turn becomes a branch… The art pages are interleaved on a softer newsprint: design in perfect harmony with the tone and the texture of the poems. All things are drawn towards the gorge: the bees, the doves, the poet, the buzzard that takes the place of Rilke’s angels. Even the nearby towns and their historical occupants seem to be tumbling inexorably into its maw. Yet the gorge is full of life, the scufflings of small creatures, the bodies, the voices of mythic lovers, and by the end of the sequence the whole piece coheres into a profound— and rather beautiful— meditation on the oneness of the world and ‘the terrible shortness of time’.